Taisys’mBanking solution is a secure, SIM-based mobile banking solution allowing complex banking transactions on the mobile device even without the use of a smart phone. 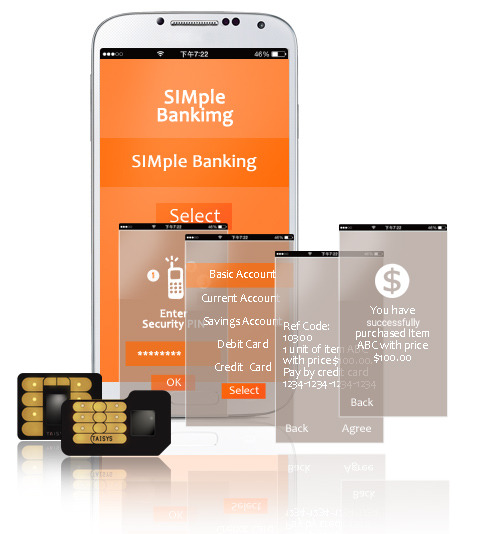 Through the use of Taisys’patented SIMoME™, financial institutions can issue their mBanking solution independent of the Mobile Network Operator on the ultra slim form and have it inserted in the user's mobile device for use. In this way, the financial institution can offer highly customized and secure solutions to their end users. The mBanking slim SIM card functions as a native banking application, security authentication form factor, and a Hardware based OTP generator all in one card. It provides the financial institution the option of offering secure mobile banking to their users with highly affordable infrastructure investment and allows extensive banking services such as money transfers, P2P payments, and bill payments to their users.